City officials in Chittenden County are weighing the economic benefits of the Air National Guard’s proposed plan to bring F-35 fighter jets to Burlington International Airport, and they’re also raising concerns about noise levels and government transparency. An Air Force environmental impact report makes clear that noise from the new jet would spread over a wider swath of Chittenden County than the existing F-16s create. 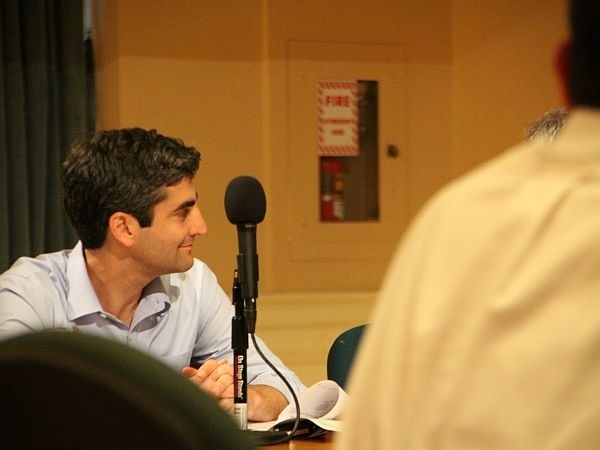 Outside Burlington’s City Hall Monday night, it was relatively quiet as Mayor Miro Weinberger got updates from one of his aides attending a public hearing on the jets in South Burlington. "I have a representative of the office out there listening, reporting back," Weinberger said, thumbing his smartphone. As a former airport commissioner, Weinberger says he’s already up to speed on the F-35 debate. On one hand, he says, it’s important to support the National Guard and its 1,000 jobs, which generate $50 million in economic activity each year. "The economic benefits are significant and they clearly will weigh heavily in a decision." Weinberger stepped down from the airport commission after he was elected in March. Now, as mayor, he’s leaning toward supporting the F-35 program. But first he wants to learn more about noise. "I want to make sure that’s not a perspective I’ve overlooked in coming out with a position," Weinberger said. The Environmental Impact Statement released by the Air Force shows the F-35 would produce higher noise levels over a greater area reaching into residential areas of Winooski. "I have significant concerns about the impact of the proposed F-35 basing on the community of Winooski," said City Councilor Sarah Robinson at the public hearing. "Basing the F-35A fighter jets in South Burlington would represent more than a 50 percent increase in the number of acres subjected to increased noise." Winooski’s City Council hasn’t taken a formal position, yet. Mayor Mike O’Brien says that’s because, so far, there’s been a lack of transparency surrounding the Environmental Impact Statement, or EIS report. "We did not receive the EIS report," O’Brien told the audience at the public hearing. "We picked it up online; haven’t had a chance to go through it." Speaking Tuesday on Vermont Edition, General Michael Dubie, the head of the Vermont National Guard, said that miscommunication was a serious oversight. "We were thinking about South Burlington and Williston who we’ve dealt with extensively," Dubie said, apologizing. "We’re going to reach out to the mayor and the community." Dubie says the F-35 is critical to the Vermont Air Guard, and if the jet isn’t based in Burlington, the Guard might have to dramatically scale back – or even shut down.